In 2006, vaquita, a diminutive porpoise making its home in the Upper Gulf of California, inherited the dubious title of world’s most endangered marine mammal. Nicknamed “panda of the sea” for their small size and beguiling facial markings, vaquitas have been in decline for decades, dying by the hundreds in gillnets intended for commercially valuable fish, as well as for an endangered fish called totoaba. When international crime cartels discovered a lucrative trade in the swim bladders of totoaba, illegal gillnetting went rampant, and now the lives of the few remaining vaquitas hang in the balance. Author Brooke Bessesen takes us on a journey to Mexico’s Upper Gulf region to uncover the story. She interviewed townspeople, fishermen, scientists, and activists, teasing apart a complex story filled with villains and heroes, a story whose outcome is unclear. When diplomatic and political efforts to save the little porpoise failed, Bessesen followed a team of veterinary experts in a binational effort to capture the last remaining vaquitas and breed them in captivity—the best hope for their survival. In this fast-paced, soul-searing tale, she learned that there are no easy answers when extinction is profitable. "Vaquita is a lucid, informed, and gripping account of a species that will soon be lost in the absence of effective actions...Bessesen approaches the plight of the vaquita with the thoroughness and inquisitiveness of a scientist and the passion of an environmentalist. She has written a must-read for anyone keen to understand the realities of protecting biodiversity. In doing so, she fulfilled a promise she made to a small female vaquita that died from entanglement in a gillnet: 'I will tell your story...'"
"Passionate...a heartfelt and alarming tale." "Gripping...a well-told and moving tale of environmentalism and conservation." "A compelling story surrounding yet another species imperiled by human activities." "Wonderful, heartbreaking...Vaquita is beautifully written." "[Bessesen], with endless determination and at no small risk to herself, explored both the world of the porpoise and a web of greed and corruption as deadly as the gillnets that may be the last thing the last vaquita ever sees...If the heroes in this book do not inspire you, you have no heart: if the villainy does not infuriate you, you have no soul. That's how memorable this book is." "If Rachel Carson had written a True Crime book, it might read like Brooke Bessesen's Vaquita. This fast-paced story of pirate fishermen, smugglers, killer cartels, dedicated scientists, whale warriors, and Navy dolphins is also a cautionary tale. It's no longer about saving the dolphins or the whales. It's about saving ourselves." David Helvarg, author of "The Golden Shore: California's Love Affair with the Sea"
"The story of the critically endangered vaquita desperately needs telling—and no one can tell it better than Brooke Bessesen. She writes with authority and heart of a conservation crisis that must be addressed now—lest we lose forever, on our watch, the world's smallest and most mysterious porpoise." Sy Montgomery, National Book Award Finalist for "Soul of an Octopus"
"The vaquita's story is a morality tale for the Anthropocene. How many species will we let slip to their extinction in full knowledge of what is happening, and with the means to prevent their loss so readily available? This beautifully written book serves as a warning that half-measures and compromises in conservation have terrible consequences; opportunities missed may be missed forever." Join us at the Aquarium to learn more about the smallest and most endangered porpoise. You can help the Aquarium of the Pacific spread the word about a critically endangered species on International Save the Vaquita Day. Found only in the northern part of the Gulf of California, Mexico, the vaquita porpoise is the world’s most endangered marine mammal. Fewer than thirty vaquitas remain, according to a report by the International Committee for the Recovery of the Vaquita (CIRVA). On Vaquita Day, Aquarium guests can attend a special presentation at 11:00 a.m. by Brooke Bessesen, participate in a vaquita selfie station using the hashtag #4aporpoise, the event also includes films, a game, and shows. COST: Included with general admission: $29.95 for adults (12+), $17.95 for children (3-11), $26.95 for seniors (62+), and free for children under three years old and Aquarium members. The author and longtime Phoenix Zoo veterinary technician presents her latest nonfiction book, Vaquita. In 2006, Vaquita, a diminutive porpoise making its home in the Upper Gulf of California, inherited the dubious title of world's most endangered marine mammal. Nicknamed "panda of the sea" for their small size and beguiling facial markings, vaquitas have been in decline for decades, dying by the hundreds in gill-nets intended for commercially valuable fish, as well as for an endangered fish called totoaba. When international crime cartels discovered a lucrative trade in the swim bladders of totoaba, illegal gill netting went rampant, and now the lives of the few remaining vaquitas hang in the balance. Bessesen takes readers on a journey to Mexico's Upper Gulf region to uncover the story. She interviewed townspeople, fishermen, scientists, and activists, teasing apart a complex story filled with villains and heroes, a story whose outcome is unclear. When diplomatic and political efforts to save the little porpoise failed, Bessesen followed a team of veterinary experts in a binational effort to capture the last remaining vaquitas and breed them in captivity—the best hope for their survival. In this fast-paced, soul-searing tale, she learned that there are no easy answers when extinction is profitable. The Literate Lizard Bookstore is proud to host Arizona author Brooke Bessesen in a discussion and signing of her new book Vaquita, about a Baja California porpoise that has become the world’s most endangered marine mammal. This free event will appeal to all nature and wildlife lovers, as well as to fans of her Arizona Wildlife Guide and her popular children's book Zachary Z. Packrat Backpacks the Grand Canyon. This event will take place in the Si Birch Room of the Sedona Public Library. Books will be available for purchase. As Brooke Bessesen writes in her new book, Vaquita: Science, Politics, and Crime in the Sea of Cortez, “Conservation is messy business.” Economic, cultural, political, and legislative forces all come into play when considering protection strategies for an at-risk species. And, frustratingly, the best approach for victory isn’t always clear. Local communities have to balance potential job losses and preservation of their cultural history with conservation goals. When governments help or hinder the cause, lawsuits become tools for action. Because of these complex dynamics, key players in the conservation effort may, at times, find themselves at odds—even if their end goal is the same. This webinar, Saving Vaquita: Considerations in the Race Against Extinction, moderated by Dr. Tom Jefferson, explores the complicated issue of endangered species recovery through the lens of the now extremely rare porpoise, the vaquita. The question is asked: When it comes to saving a species, is it possible to unify all concerned parties to fight for a common, singular objective? Bessesen will introduce the world’s smallest cetacean and explain the history of its plight. By examining the economic, cultural, and legislative aspects of vaquita conservation, audience members are encouraged to consider the universal goals and challenges related to disappearing species worldwide. We end with a Q&A for participants to ask their own questions about how conservation works. ENTANGLED: A Deep Dive into the Vaquita Crisis. Join us for a unique Speaker Series event with researcher, Brooke Bessesen to hear her talk about Vaquita conservation efforts. When Brooke set out to write a book about the smallest cetacean, she had no idea how high the stakes would change. For 22 months, she followed scientists studying vaquitas and the organizations and honest fishermen facing grave risk to save these tiny porpoises. Attempting to reconcile the conflicts obstructing conservation amid rising violence and a plummeting vaquita population, Brooke found herself on a raw, personal journey to the doorstep of extinction. In this presentation, she shares stories from the field and helps clarify the historical and immediate forces driving a species to the brink. After her talk, she will be signing her new book, Vaquita: Science, Politics, and Crime in the Sea of Cortez. When wildlife researcher Brooke Bessesen set out to write a book about the smallest cetacean, she had no idea how high the stakes would be. Traveling into Mexico, she found a cartel drama unfolding. Over the next twenty-two months, she followed the scientists studying vaquitas and the organizations and honest fishermen facing grave risk to save these tiny porpoises. Attempting to reconcile the conflicts obstructing conservation amid rising violence and a plummeting Vaquita population, Brooke found herself on a raw, personal journey to the doorstep of extinction. In this presentation, she helps clarify the historical and immediate forces driving the species to the brink and explores viable solutions to the crisis. Brooke is the author of the new book: Vaquita: Science, Politics, and Crime in the Sea of Cortez. Brooke's talk will be followed by a question and answer session (~Approximately 11:00AM-12:00PM). Get the study guide for Vaquita here or read it below. The vaquita is not hunted. Nor is its habitat disappearing or degraded. Nicknamed “panda of the sea,” this diminutive porpoise is even protected by law. So why is the species on the brink of extinction, with fewer than twenty animals remaining? 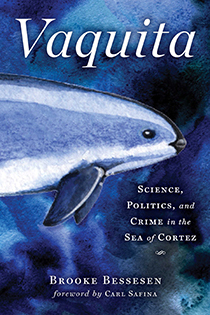 Vaquita: Science, Politics, and Crime in the Sea of Cortez unravels the haunting story of the world’s most endangered marine mammal and asks, is there time to save the vaquita? And why does it matter? Author Brooke Bessesen brings readers to Mexico’s Upper Gulf region, the only place the porpoise is found, to untangle the intricate controversies behind its precipitous decline. The result is a soul-searing story that gives readers an in-depth look at a disappearing species and highlights the brave efforts of those fighting to bring vaquitas back from the brink. We sat down with Bessesen to talk about vaquita, international cartels, and an unlikely fish called the totoaba. Have more questions for Bessesen? Share them in the comments below. The vaquita is one of the most endangered animals on the planet. How many vaquitas are left? Did the possibility of their extinction impact how you wrote and thought about the book? The most recent official population estimate reports less than 30 vaquitas. But that was from 2016; with a current rate of decline upwards of 50% there are now far fewer. It has been agonizing to know I might be documenting the extinction of a species, but at this terrible moment in history we cannot turn away. If vaquita does disappear, the whole world needs to be watching. We must all force ourselves to witness the truth of our current circumstances and feel some loss. Perhaps when our hearts are broken will we make haste for change. How did you first become interested in the story of vaquita? I first learned about vaquita in 2008 while visiting a research station in Rocky Point, Mexico. At that time the population estimate was 245—down from 600 in 1997. Two years later, at a cetacean conference, I was encouraged to write about vaquita, but I was immersed in field studies in Costa Rica and working on another book. When I finally started researching the topic in 2016, I was shocked to discover the level of crisis. Going into Mexico, I had no idea how harrowing this story would be. Vaquita explores the possibility of ex situ and in situ conservation. What is the difference between these approaches? Is breeding vaquitas in captivity an option? Ex situ means “off site.” It is a conservation strategy that places at-risk species in captivity. Last fall an ex situ vaquita recovery effort was undertaken. Two vaquitas were captured but both suffered acute stress and one died of cardiac arrest. With so few vaquitas left, ex situ is no longer a viable option. In situ, “on-site” conservation must now be successful for the species to survive. You traveled to Mexico and interviewed fishermen, scientists, townspeople, and more for the book. Does a particular story or conversation stand out to you? The black market for totoaba has put vaquitas in peril of extinction. Totoaba are also critically endangered. Are there conservation efforts aimed directly at totoaba? What lessons can conservationists learn from the connection of these species? There is a totoaba hatchery in Ensenada that has been able to raise and then release hundreds of thousands of totoaba back into the Upper Gulf. So although the totoaba is still listed as critically endangered, its numbers are not nearly as low as vaquita. One lesson may be that while both of these animals—one fish, one mammal—are victims of the same gillnets, their recovery plans must take two different approaches. And there’s a lot more urgency with vaquita. If the vaquita and totoaba go extinct, it doesn’t sound like that’s the end of the story. Criminal cartels will move on to the next available marine species to exploit. Is there any hope in stemming the tide? Are there efforts to discourage the use of animal parts in traditional Chinese medicine? I think in the case of totoaba, drug cartels simply acted as opportunists. That said, the international black market for endangered wildlife parts is a multi-billion-dollar industry. Programs that strive to discourage sales in China are essential to elicit cultural shifts; however, the enforcement of national regulations in related countries can have a more immediate effect. Unfortunately, corruption and consumerism too often drive politics. It’s pretty hard to point fingers when totoaba is trafficked through the United States and the Trump administration just lifted the ban on elephant tusks. In the book you write that “The situation is bleak, but we cannot lose hope. Should apathy prevail, every step toward positive change will falter.” What do you mean by that? Why is it important to tell the story of vaquita and other endangered species? Humans are fueled by hope. In our darkest moments, it is the belief that things can be better that gets us off the floor and into action. Of course, having hope does not require sugarcoating reality. People don’t want emotional protection. They want the truth. And the truth is that every species extinction portends our own eventual demise. Hope lies our power to change course. Did you find anything in the course of researching and writing this book that surprised you? Almost everything surprised me! This book was a journey of unexpected back alleys, mirrored mazes, and stumbles down rabbit holes. Through it all, I came to realize that getting gillnets out of the Upper Gulf—the one and only thing needed to save vaquita—is simultaneously the most-simple and the most-impossible task. Anyone who loves puzzles will appreciate the conundrum. What do you hope readers will take away from Vaquita? Because I believe a good book tells a small story that poignantly speaks to a larger one, I hope to hook readers into pondering not only the potential loss of vaquita, but also today’s broader ecological crisis, which involves dozens of endangered species around the globe. I cannot force readers to action. But if I can get them to stop, to look—to really look at this crisis—if I can plant the seed of contemplation, perhaps something good will grow.